Time is sure flying by! Last week the FC book club met at Joanie’s house and discussed “Plain Truth” by Jodi Picoult. For the second time this year, I didn’t have the book finished by book club night! Yikes. Just so many books – and I’m just such a slow reader. So I quickly read the last page – the trademark Picoult shocker – so that they wouldn’t have to worry about spoilers. The discussion questions included in the book bag were mostly intellectual but we had a good discussion about the Amish and our belief in ghosts. It was a good discussion with good food and good company. Now what’s next to read? We didn’t decide… but will get something picked soon! I’m listening to “Jane Eyre” on audio and loving it! I’m on disc 8 out of 18 and finding it easy to listen to and an interesting story. I haven’t read anything by either of the Bronte sisters nor seen the movies about their books. 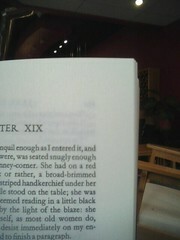 I signed up for the goodreads “Jane Eyre” challenge, because I saw the movie trailer and thought it looked good. It comes out next week, I believe, but we’ll see if it comes to the theatre near me that soon or not. After I finished “Plain Truth” on Thursday, I picked up “Juliet, Naked” by Nick Hornby. It’s about a couple who live in England and the guy is obsessed with a band. They traveled to US to visit the urinal he visited when he decided to quit being a musician, stand outside the woman’s house who caused him to quit being a musician, etc. It will be interesting. Next on my TBR list is “Mockingbird,” a YA novel about a kid with autism and on audio it is “Major Pettigrew’s Last Stand.” Lots of reading to do! Any suggestions for my FC book club? I think we have about exhausted the choices at the Rochester Public Library for their book clubs in a bag. Everything is either checked out and reserved through 2011 or we’ve read it or we’re not interested… so we’re looking for ideas of things readily available in the library or cheaply available. Ideas? This entry was posted in Book Club Books 2011, General Book Talk and tagged Book discussion club, Jane Eyre, Jodi Picoult, Juliet Naked, Nick Hornby, Plain Truth. Bookmark the permalink. I haven’t started Plain Truth… should I start it or save it for a summer read? I have major pettigrew…is that our next walkie talkie pick? There are so many options! I have Major Pettigrew on audio and actually gave it to Koni to listen to first… Since I’m half done with Jane Eyre, I imagine it will be two weeks before I can start listening. But it could be a discussion soon! I’m plugging away through Juliet, Naked and then I have Mockingbird, but I’m open to something else! Or you could read Plain Truth in the midst of this and then we could do Major Pettigrew next! So much to think about!